Mouth: the power of opening. A place formed by such a power is called a mouth. It mouths, or gives forth. It also mouths and receives. It is a place of passage. It is also a force of great variation in intensity. Humans use mouths to emit oral language. When that language is unvoiced, it is said to be mouthed, or held. In this sense, mouth differentiates between gradations of behaviour. A bird dog that brings back a bird from the field without puncturing its skin, for example, mouths it, while an animal that damages it mauls it. (Instead of a mouth, it has a maul.) In a less complete limitation of the full power of opening the body to the world, however, a woman (for example) with the ability to speak voices her words, while one who does not is mute. If she is unable to speak at all, she is said to be mute, and even to be a mute. Muteness is, however, considered to be a diminishment of human power that comes from social context. A man who speaks loudly but is unheard among men with a different focus is said to be muted. In an extended sense, photographs, such as the one below, are mouths. They give voice to the body and accept things into it. They are points of passage. When their points are clear, they are said to be dramatic, as if spoken on a stage. When their points are less direct, they are said to be muted, as if spoken in a room backstage. 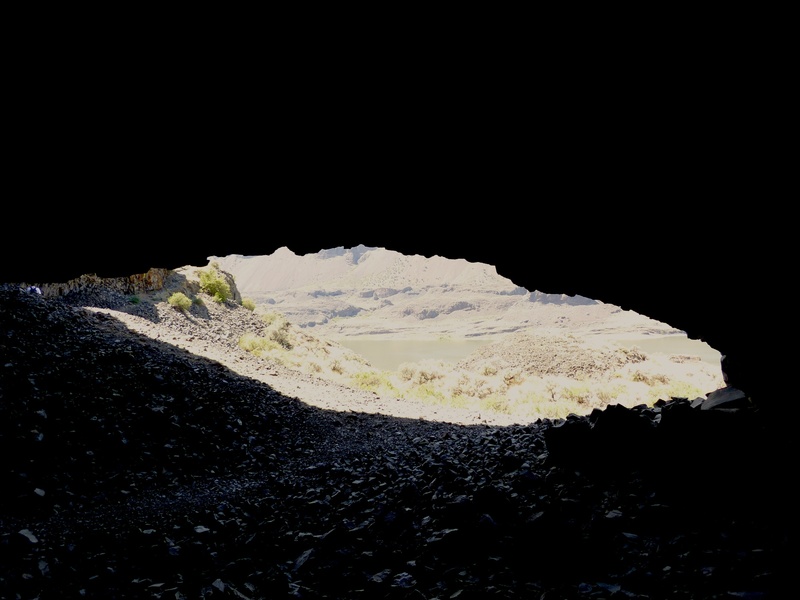 The Lake Lenore caves were used as shelters in the sacred Lower Grand Coulee since the post-glacial floods carved them out of the flood basalts of the Columbia Basin after the last ice age.